The ideal wear-resistant screen for the most aggressive screening applications. Ceramic Hybrid Screens incorporate advanced CorroCeramics molded within the rubber matrix to provide wear life that exceeds the wear life of standard rubber panels by as much as 10 times or more. When screening applications are in the presence of aggressive conditions, such as extreme impact and abrasion, ceramic elements are incorporated into the rubber screen design to improve the overall screening operation in terms of wear life, safety, availability, efficiency, and cost-effectiveness. Ceramic hybrid screens from Corrosion Engineering are generally constructed with a modular design for ease of installation and typically deliver up to 30 times the life of conventional steel screens. 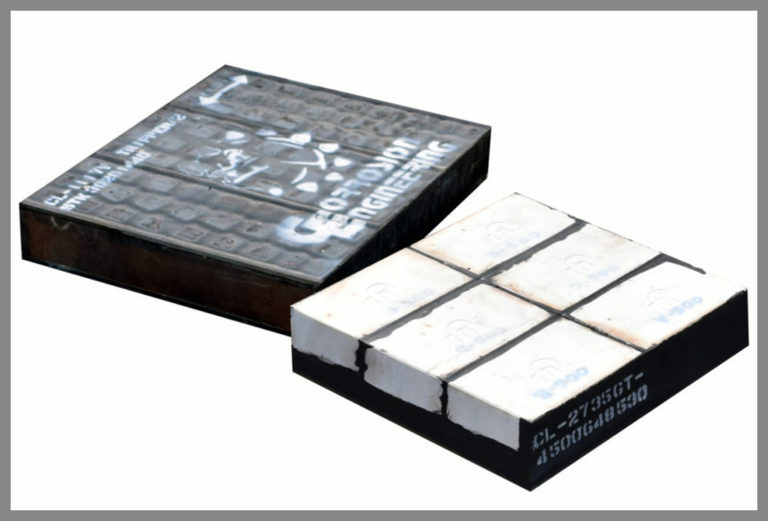 Ceramic hybrid screens consist of Corrosion Engineering’s advanced CorroCube and/or CorroCylinder ceramic elements to provide exceptional resistance to corrosion, wear, impact, and sliding abrasion. Our high performance wear ceramics will outlast materials such as carbon steel, Ni-Hard, stainless steel, abrasion-resistant steel (AR) and others by a factor of 10 to 30 times. This translates into longer equipment life, lower maintenance costs, and reduced process downtime resulting in higher productivity. Ceramic hybrid screen panels are designed to resist extreme impact, abrasion, and heavy loads while maintaining exceptional screening efficiency provided by our advanced abrasion-resistant rubber compounds, molded tapered openings to prevent plugging, and our proprietary Hi-Pro slot.